Celebrating Picture Books in Picture Book Month! Because November is Picture Book Month, I have some very special picture books to share with you! Watch over the next four week for lots of picture book reviews. 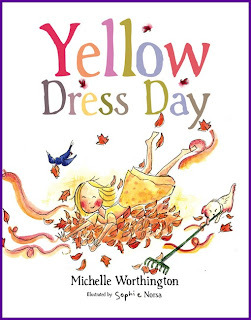 The first is Yellow Dress Day a children's picture book by Michelle Worthington, illustrated by Sophie Norsa and published by Australian publisher, New Frontier (2012). Ava wears a different coloured dress for each type of day - a red dress for hot days, a purple dress for rainy days and a blue dress for cold days. One whistling, whirly, windy morning, Ava and her puppy want to go out and play. But Ava’s favourite coloured dress was missing. Will Ava’s mother find something for her to wear on her yellow dress day? This book will delight all young girls and appeal to any parent of a child with special needs. On blue dress days snowflakes swish and swirl and fall like sparkles from the sky to make Ava's nose twitch with the cold. The book designer has enhanced sentences like this with different colour, font size and placement - great discussion point when you're sharing Yellow Dress Day with kids. The story is simple but I also loved the underlying reminder to kids: it is not necessarily a disaster when you can't get what you want. Think creatively and find a different solution. The book cover of Yellow Dress Day is instantly appealing. In fact, the colours used in Norsa's artwork throughout the book are joyous and uplifting. Ava's delight in her activities and her consternation when she can't find the dress to match the day come through clearly. There is lots of movement in the illustrations as Ava whirls and twirls in the wind. And finally, kids will delight in finding Ava's animal friends throughout the book. 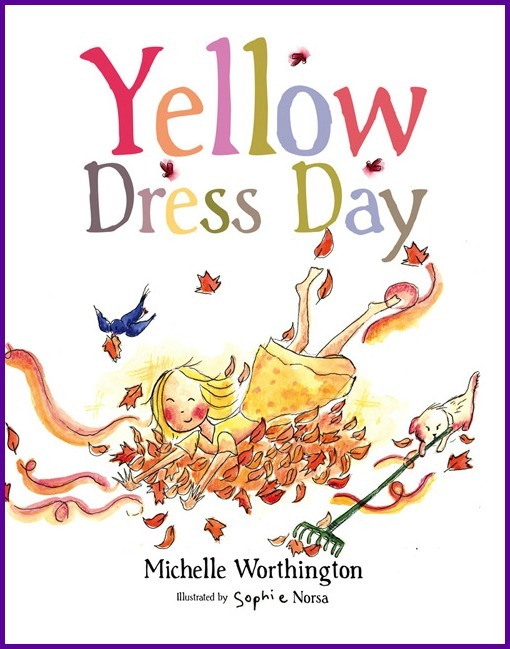 Would Yellow Dress Day make a memorable picture book gift for a special someone in YOUR life?